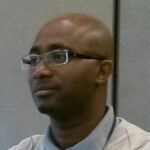 Dr. Arthur N. Konan is a Research Engineer at West Virginia University Research Corporation. Dr. Konan earned his Ph.D. in Fluid Dynamics from Institut National Polytechnique de Toulouse (France) in 2007. He was a Post-doctoral Researcher at the Institut de Mécanique des Fluides de Toulouse (France) from 2007-2010where he worked on subgridfluid turbulenceeffects on the particle phase statistical property prediction,the modeling of the phase change of poly-disperse uranium particles to gaseous compounds used as fuels for nuclear energy systems, and the melting of solid raw materials in a cupola. Dr. Konan applies his modeling expertise of the reacting multiphase granular flows to help improve the understanding of the Chemical-Looping Combustion Systems currently under active investigation at the NETL.